120V / 1Ph Electric, 10-gallon (37.8L) 26" x 18" x 19.75"
(66 cm x 45.7 cm x 50 cm) 45 lbs. 240V / 1 Ph Electric, 10-gallon (37.8L) 26" x 18" x 19.75"
240V / 3 Ph Electric, 10-gallon (37.8L) 26" x 18" x 19.75"
20V / 1 Ph Electric, 10-gallon (37.8L) 26" x 18" x 19.75"
240V / 3 Ph Electric, 15-gallon (56.8L) 30.5" x 18" x 19.75"
(77.5 cm x 45.7 cm x 50 cm) 50 lbs. 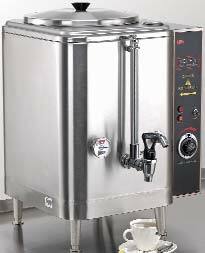 120V / 1 Ph Electric, 15-gallon (56.8L) 30.5" x 18" x 19.75"
240V / 1 Ph Electric, 15-gallon (56.8L) 30.5" x 18" x 19.75"
Electrical: Specify voltage, 120V, 1.8KW; 208V, 5.3KW; 240V, 7KW, 1Ph, export voltage available. • Indicates Chinese label model. In a class by itself, the MPO coffee urns are unique in their ability to brew coffee where water lines are not available. 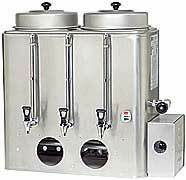 Constructed of high quality stainless steel, enjoy years of brewing endless gallons of coffee with this urn. Available in Electric models only. 208/240V 1/2" water line required. Adjustable By-Pass System - gives an operator the ability to adjust the strength of the coffee to bring out its natural robust and fully body taste. Automatic Refill - automatically replenishes urn jacket with fresh water as soon as it starts running low giving you piping hot water on demand. 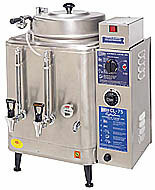 Automatic Agitation (FE series only) - at the end of each brew cycle, all FE urns automatically blend the coffee. Thereafter, just "Push the button and walk away" the FE series agitates the coffee automatically. Cycle Stop Switch - Conveniently located on the front panel, the Cycle Stop Switch gives the operator the ability to stop the brew cycle midstream. It's also ideal for cleaning purposes.